Product information "Zomo P-DDJ-SX Plus NSE - Flightcase Pioneer DDJ-SX"
The Zomo Flightcase P-DDJ-SX Plus NSE (NSE = NIGHT STYLE EDITION) is exactly suitable and developed for the Pioneer MIDI-Controller DDJ-SX. In addition, there is an extra notebook shelf included for your notebook, your mouse and any other devices like an effect processor or an interface. The board is movable on rails. So you can push or pull it easily. You can transport your notebook safe and secure by using the hook-and-loop fasteners to fix it on the shelf. With this Zomo NSE Flightcase you can not only transport your complete set up easily but also start to control your devices immediately. The Zomo P-DDJ-SX Plus NSE is extremely robust and protects the Pioneer DDJ-SX against scratches, dust and other damages. Each NSE case is made of 9 mm plywood, which perdures that the flightcase looks great for long time. The extra-wide aluminum profiles and the solid ball edges are coated in black and these stabilize the Zomo Flightcase Set, too. The surface of the housing is very resistant to abrasion and cigarette burns. This Zomo Equipment Case P-DDJ-SX Plus NSE provides real professional quality and is good looking in modern black NSE style! 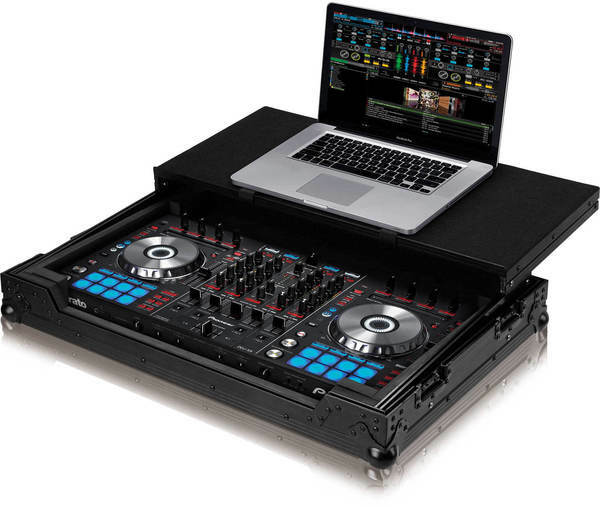 Customer ratings for "Zomo P-DDJ-SX Plus NSE - Flightcase Pioneer DDJ-SX"
Zomo Flightcase DDJ-SX2 .. fantastico!! Una vera e propria fortezza corazzata per la nostra DDJ-SX2 !! Una culla che da sicurezza e protezione per il controller per cui è stata progettata. Chiusure che serrano la copertura in modo forte e sicuro, maniglia robustissima, piano notebook funzionale che scorre fluido con fine corsa sicuro, imbottitura sagomata che trattiene il controller in modo perfetto, accattivante aspetto dark full black! Unico neo il peso, ma la robustezza ha un suo prezzo e non si può trovare di meglio, 5 stelle meritate! Un punto a favore anche per i tempi di spedizione; sono del sud Italia, ma è come avere questo stupendo store dietro langolo! Grazie RECORDCASE!! très bon article. fabrication de qualité pour une marque de référence haut de gamme. design et modularité au rendez vous. une valeur sure. Sieht sehr edel und chic aus. Selbstverständlich robust und funktionell. Das worauf es bei einem Case ankommt. Der Controller passt absolut perfekt in das Case, kein wackeln oder hin- und her rutschen. Der ausfahrbare Schlitten läuft sauber und leicht und hat auf jeder Seite eine Sperre, damit er nicht aus versehen herausrutscht. Außerdem bietet er sehr viel Platz für Laptop, Mikrofon oder Kopfhörer. Was man auf den Bildern nicht sieht ist ein Kabelschacht, wo alle Kabel inklusive Netzteile während dem Auftritt sauber gut verstaut werden können. Die Verschlüsse sind sehr gut verarbeitet halten den Deckel im geschlossenen Zustand fest in seiner Position. Das Case bietet gute Qualität und hebt sich von der normalen schwarz/silber Optik sehr gut ab, Eine echte Kaufempfehlung! I bought this flightcase for my new Pioneer DDJ-SX online from recordcase.de.The quality is great,Im really happy.This is the second time Im buying from this dealer,they are exellent and and really kind.My pioneer DDJ-SX fits precisely into this case.The shipping time was really good,didnt take more than 9 days to be delivered here in Albania.